I did go to Target in mine!... and my son says all those things now.. he'll get over it. Those look so comfortable. I would wear them to the mailbox. I don't think I would wear them to the store. Haha! At least you're comfortable! Livie gets mad at me when I sing along with '80s songs in the car! Do your boys get irritated when you sing along with a good song in the car? My blog is in Portuguese? S to translate? s? click on the flag that you want. Ha, hang in there mom. Our older boy is at the age where he is embarrassed by the Mrs. He is ok with me for now. With the emphasis for now. I cannot even imagine - and YET - I so CAN! Love the new header. Fantastic pics. Cannot believe how quickly the boys are growing up!! Too funny. I often find myself driving down the driveway only to realize I still have on my slippers. They will appreciate your fashion sense once they have kids of their own. Ha. Oh I love it! Kids can say the cutest things...when you least expect it! Part of living by myself is not worrying what I wear around the house.It is 10am and I am still in jammies. Found you blog link on Stuff Could Always Be Worse! They look cool! At least they're not pink and fuzzy, right? My oldest is 14...he has learned to just laugh and love me through the embarrassing moments. He learned quickly that letting on he was embarrassed by me only made me want to try harder to turn his sweet face red! lol I ran into an older man at our tiny minute mart gas station and he was in his PJ's, house shoes, and robe....with his own coffee cup filling it up from the machine. So, I think your habits are still pretty safe. LOL....I am sure it won't be long. Kids seem to grow up much faster than we did. Ha, this is great. I wonder at my end how long it will be before I hear about the yoga pants. He might take the sweet route of getting you to wear something different like my son does by telling you how good you look when you wear nice things! lol My son goes wild when I dress up when we are going somewhere. I won't leave the house looking shabby like I do at the house! lol There are mothers at his school that hate me because I dress up! Seriously, there have been comments made to me about it! lol They would die if they seen what I wear around the house! At least you're not walking out there in your bathrobe and bare feet! Ha ha ha ha!!!! I love this!!! You and me both! Yes, I have started going out in my slippers, but so far it's only if I am not getting out of the car. But I sense it creeping up, getting out of control!!! I'm glad to see it's not only us old folks, but young and healthy ones like you, too!!! For me, it is rather a chore changing my shoes, as I need surgery on both knees. 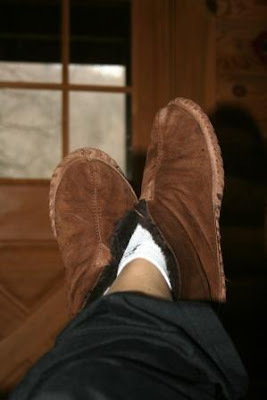 Actually we have the same style slippers, mine are just like this. Only I have them in different colors. And you look better in Yoga pants than anyone I have seen! That is so cute! Glad that my kids don't worry about what I wear, just yet anyway. Thanks for the laugh. Believe me after seeing the most recent Walmart photos you would look really dressed up in those slippers! Your slippers look comfy enough to wear anywhere! My bot in middle school still lets me wait with him at the bus stop in the morning. I figure he knows that if he complains it will only get worse! This is so cute! I have heard similar words from our children when they were younger! Hey, I think I'd be doing EVERYTHING in those! They look SO comfy! LOL, I love the yoga line. That's so funny! I wear my ugly Uggs to the bus stop every morning and afternoon. Even with yoga pants tucked into them.